There’s something about 99 Percent Mine that underwhelmed me. I, as many others, expected so much from this after The Hating Game and I’m not going to compare both books for my review and hold The Hating Game against 99 Percent Mine. They’re both two different books and I get that. However, this book didn’t excite me or make me feel any of the feels I expect from this rom-com! I absolutely love rom-coms. They’re my thing. I love rom-com movies and when I read rom-com books I’m all for it. Since the end of last year, I started picking up more romance in general and typically lean towards rom-coms because I love them so much for their mushy gushy feels and I didn’t get much, if any, of that from this. I also couldn’t connect with any of the characters either… I wouldn’t have cared if anything happen to any of them. Let’s start off with the weird complex of Darcy being convinced that Tom is the only great guy left in the entire world. She travels a ton and leaves home until she runs out of money all while comparing the men she’s with and even just meets to Tom but each guy she gives a chance to are total trash… on purpose! All the places she puts herself are rough parts of town where she meets iffy men. How’s anyone suppose to get over someone when comparing how awful the men she does meet are trash? She’s intentionally looking in the worst places and choosing the worst men that don’t treat her well. All while Tom is in a serious long-term relationship and engaged. Tom is Darcy’s twin brothers best friend and completely off limits. Making her love for Tom never going to happen and it’s why she keeps leaving town and choosing whatever guys to fill her time… As she’s waiting for Tom to become available even though he’s engaged, which is super unhealthy and destructive behaviour… Darcy also has health issues, she has a weak heart, that she does not take care of during her destructive path and she hates when people treat her differently because of it. More destructive behaviour. For some reason, I felt a bit uncomfortable with Darcy and Tom’s relationship. It felt unrealistic, kind of unnatural, and I really didn’t like how Darcy was SO destructive for a man. I believe Sally Thorne knows how to write a realistic relationship timelines and well-written characters but I didn’t get any of that in this book. 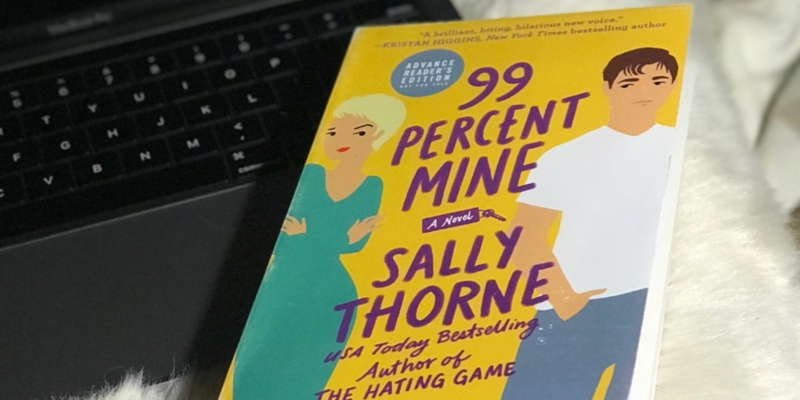 I at least wanted to get the emotions that I know Sally Thorne can write and I barely felt any emotion while reading 99 Percent Mine. I’m pretty sure if I felt emotions from this I would have let how destructive Darcy’s longing for Tom was (but of course I would have still mentioned it). I give 99 Percent Mine 2.5 generous stars. I didn’t love it but I didn’t necessarily hate it. I found it mediocre. I honestly only finished the book because it’s written by Sally Thorne and I was waiting for the book to redeem itself. I’m curious to read the next book Sally Thorne writes, whenever that is, and hope to feel all the emotions and connections with the characters as much as I did with her first book.